Yesterday was a good day for those proposing that extraterrestrial life currently exists on Mars. In a Dec. 16 paper published in the journal Science, NASA says that significant methane levels were detected by the Curiosity Rover over a two month period suggesting that “Mars is episodically producing methane from an … unknown source.” The “unknown source”, as a number of mainstream media articles were quick to point out given what is known about the creation of methane, may be extraterrestrial life, The New York Times published an article titled, “’A Great Moment’: Rover finds Clue that Mars May Harbor Life,” The Guardian wrote “Methane ‘spikes’ fuel speculation of life on Mars.” ScientificAmerican used as its subtitle: “New results suggest evidence for extraterrestrial life could be near at hand.” This is not the first time that NASA has released scientific data pointing to life on Mars. On previous occasions, NASA scientists argued over the results. Judging from the number of authors to the Dec. 16 paper, there appears to be rare unanimity. Are we on the verge of a major NASA announcement that reveals life has been found on Mars? The scientists also reported that for the first time, they had confirmed the presence of carbon-based organic molecules in a rock sample. The so-called organics are not direct signs of life, past or present, but they lend weight to the possibility that Mars had the ingredients required for life, and may even still have them. More controversial are the claims by Richard Hoover, a former NASA senior scientist who claims that in 2004, the Mars Rover, Opportunity photographed what clearly looked like the fossilized remains of a crinoid, a marine animal that looks like a sea lily. Hoover showed it to colleagues who immediately recognized the object as a crinoid. However, rather than examine the exciting possibility that Opportunity had photographed the fossilized remains of a living organism, Hoover said that less than four hours after taking the photo, Opportunity’s rock abrasion tool ground the area where the possible fossil lay into dust. He asked David McKay, the former chief astrobiologist at the Johnson Space Center, why this had been done. The response Hoover received was less than satisfactory. Gilbert’s and Hoover’s experiences suggest that there are those at a senior level in the NASA administration that have in the past deliberately prevented evidence of extraterrestrial life on Mars being accepted, and even destroyed. This makes NASA’s reversal of its previous conclusions of methane levels on Mars significant, as is the emphasis that the New York Times gives to NASA’s recent backtracking. Has NASA changed its policy on releasing evidence of life of Mars? People always ask the question ‘Why Mars?’ Several reasons: One, Mars is very Earth-like, or least used to be Earth-like. It is a planet, a sister planet to Earth. It is the most likely planet in our solar system, um, that had life at one time… may have life now, and we feel can definitely sustain life. Was this merely a coincidence, or was Bolden preparing the world public for some surprising future announcement regarding life on Mars? NASA may be simply driven by new scientific data gained by the Curiosity Rover as the Dec. 16 Science article suggests. Alternatively, it may be that there has been a recent policy shift in the higher echelons of NASA, and it is poised to release data finally confirming that life, at least in the form of primitive microbes, does currently exist on Mars. The European Space Agency (ESA) today confirmed that it was receiving a mysterious signal from Comet 67P/Churyumov-Gerasimenko. In a post on its live streaming website, it described the signal as a “mystery song” and uploaded a recording with the caption: “Hear our comet sing.” The confirmation follows months of rumors that the Rosetta mission was originally sent to explore a radio signal from the comet first detected 20 years ago. The November 12 landing of the Rosetta mission’s Philae probe will be live streamed to the world. The ESA’s surprise announcement hints that the significance of the landing may go well beyond the historic first of humanity landing a probe on a comet. There was a media frenzy back on September 29 from a UFO Sightings Daily post titled: “NASA Records Radio Signals Coming From Comet 67P For Over 20 Years!” The author, Scott Waring, cited an anonymous ESA whistleblower who wrote in an email that the mystery signal was detected 20 years ago by NASA and this was the true reason behind the Rosetta mission. If the comet is emitting radio waves, why has no one else been able to tune it?… If the radio waves were picked up by NASA, why did they leave the space mission to investigate to the European Space Agency? Well guess what? The ESA today confirmed that Waring was right and Rundle was wrong. The mystery signal is in fact “a song” being transmitted by the comet, presumably an oscillation in its magnetic field according to the ESA. The ESA did not say when it first recorded the song, but it does lend plausibility to the claims of the anonymous ESA whistlelower. The big question now is whether the song is a random composition of nature as the ESA implies, or was created by an extraterrestrial intelligence. A September 10 photo from the Rosetta mission showed what appeared to be a radio tower and a possible UFO on the surface of Comet 67P. The photo was one among others held by the ESA that the anonymous ESA whistleblower referred to as revealing some of the mystery behind Comet 67P. Could the alleged tower be the source of the mystery signal, and does the UFO suggest an extraterrestrial intelligence is involved? If the mystery signal today confirmed by the ESA was detected 20 years ago and led to the Rosetta mission, then it stands to reason that NASA and ESA believed that the signal was more than a random composition by nature. If extraterrestrials are wanting to announce themselves to a disbelieving world, transmitting a beautiful song from a remote comet does appear to be an elegant form of First Contact. Newly released video from the International Space Station’s (ISS) Live Stream shows what appears to be two cigar shaped UFOs near the ISS. The UFOs briefly appear in the video stream before there is a signal interruption. When the live stream resumes the UFOs are gone. The incident was uploaded to Youtube on October 21 and has already begun generating much discussion. It is difficult to estimate the size of the UFOs but previous sightings of similar cigar shaped objects have been estimated to be aircraft carrier sized, big enough to host smaller UFO craft. Leading astronomers and astrobiologists are now telling us that the cosmos is teeming with exoplanets capable of hosting intelligent life, and we need to prepare for its discovery. This leads to the question, are extraterrestrial ships monitoring the ISS? The latest video incident follows a string of UFOs being captured by the ISS live stream. On October 7, a UFO appeared near two space walking astronauts. The object was also elliptical or cigar shaped, and appeared to be monitoring the ISS. On January 29, 2014 the live stream showed a yellow elliptical UFO that appeared to actually have docked with the ISS. This raised remarkable possibility that the ISS was being visited by unknown astronauts from a classified military program, or even extraterrestrials. The main objection against past UFO sightings captured on the ISS live camera feed is that these are lensflares caused by the sun or a strong light source nearby as it hits the camera lens. In the live video feed of the two cigar shaped UFOs, there is no significant change in the ambient light as the UFOs slowly appear in the video. If the UFOs were caused by a lensflare, then their appearance would be marked by a clear change in the ambient light. Nor do the UFO appear to be natural phenomena occurring in the Earth’s atmosphere or surface. If the two UFOs are not caused by a lensflare, camera malfunction or other natural phenomena, what are they? The UFOs may be intelligently guided cigar shaped spacecraft that have been reported by military and government whistleblowers to be very large in size. One possible explanation is that they belong to a secret space fleet. Another explanation is that the UFOs are extraterrestrial in origin. As far back as the early 1950s, cigar shaped UFO have been regularly sighted and photographed. The most famous photographs were taken by George Adamski who filmed smaller scout ships emerging from larger cigar shaped UFOs near the moon. In a related 1952 incident, Adamski and six witnesses claimed to have sighted a large cigar shaped UFO fly overhead. It was soon followed by a smaller “scoutcraft” that landed near Adamski, who met the extraterrestrial pilot. The International Space Station’s live camera feed continues to capture strange nearby objects through its various external camera systems. Some of these objects might be explained away as lens flares or natural phenomena. Not so however for all other incidents that likely include the two cigar shaped UFOs captured on October 21. If these two UFOs are under intelligent control, they could be spacecraft from a secret space program or from an extraterrestrial intelligence. If extraterrestrials are indeed monitoring the ISS, they may be allowing their spacecraft to be captured on video in a First Contact scenario. A photograph taken by the Mars Curiosity Rover shows what appears to be an elongated skull on the Martian surface. According to an October 18, 2014, report by UFO Sightings Daily, the curious object is an elongated head similar to those found in ancient Egypt. In a Youtube video, the Martian skull like object is compared to elongated human skulls found in various Egyptian murals and the similarity is striking. Was this merely a coincidence, or was Bolden preparing the world public for some surprising future announcement regarding life on Mars? Perhaps Martian life once existed, and it was connected to ancient Egypt? The photograph was taken by Curiosity Rover on September 14, 2014 and was the focus of a video posted a month later. In the video, comparisons with various elongated human skulls depicted in Egyptian murals and statues, the suggestion is that the object is a human skull. If so, then the elongated skull may be evidence of a tangible connection between ancient Egypt and Mars. Both Earth and Mars at one time in their history possessed a human population with elongated skulls that were part of their respective planetary leaders. Whatever the origin of the mysterious object, it is unlikely that the Curiosity Rover will investigate it more closely due to the standard response by NASA that such fossil like bone fragments are just rocks. 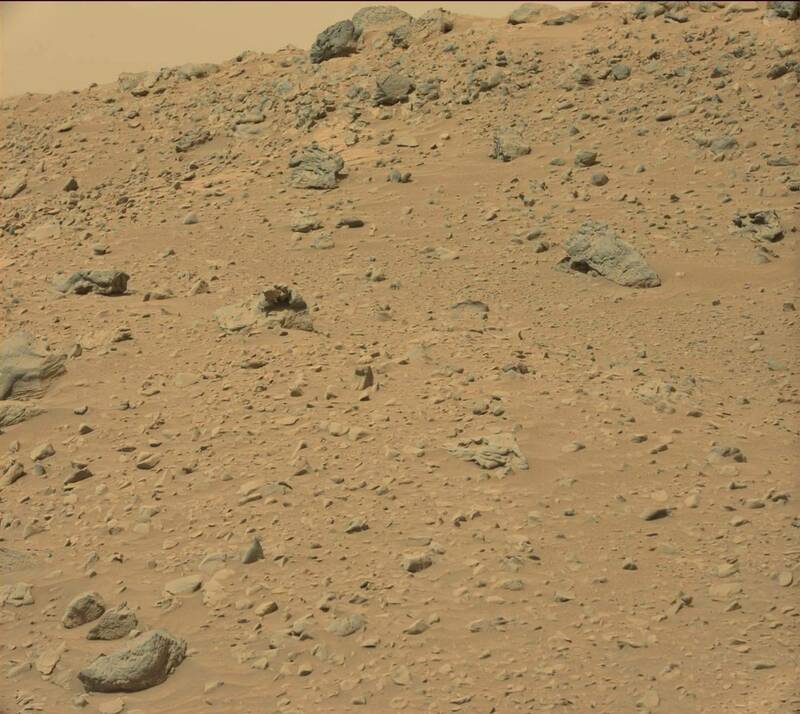 For example, in its response to a Mars Rover image of what appeared to be a thigh bone found on Mars, NASA responded that it was nothing more than rock. Former NASA employees, such as Richard Hoover, however disagree. Hoover claims that NASA administrators go to great lengths to cover up the possibility of Martian life, and in one case directed one of the Rover missions to actually destroy evidence of a Martian fossil. Perhaps NASA’s standard response is right, and the skull looking object captured by Curiosity Rover is just a rock. Alternatively, the object may be the elongated skull of a humanoid species that had a historical connection to ancient Egypt. Was NASA Administrator Bolden’s October 9 claim of past Martian life purely coincidental in timing, or the start of NASA releasing more of what it really knows about life on Mars?